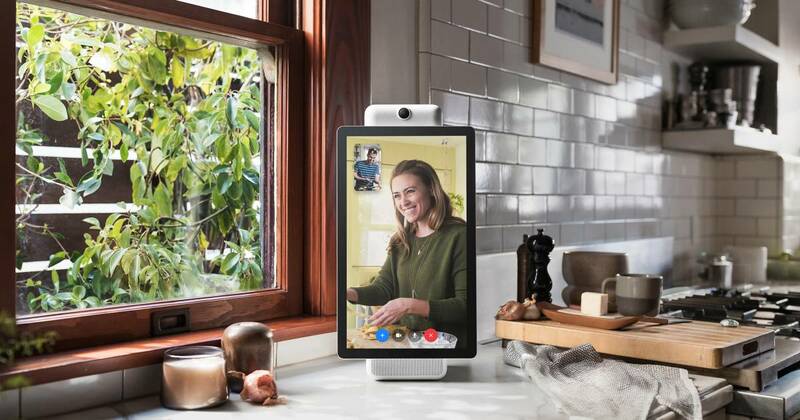 Facebook on Monday launched two in-home video chat devices, moving the company beyond its social network and into the increasingly competitive market for voice-activated, internet-connected speakers. But the launch of the devices, known as Facebook Portal and Portal+, also left people wondering how many consumers would want a Facebook camera in their homes, given the company’s struggles with user privacy. The devices are centered around video chat and feature a camera, speaker, screen and microphone. The company stressed user privacy in the announcement, touting a smart camera that does not work with Facebook’s services and promising that the company does not listen to, view or keep video calls. The devices also have a low-tech solution — a camera cover. That detail did not get by many in the tech world, who noted that Facebook CEO Mark Zuckerberg used to cover the camera on his laptop with tape. The Portals can also play music and videos from partners including Spotify and Food Network, and has Amazon’s Alexa assistant built in. One early review of the device from The Washington Post said Portal had a lot going for it by reducing the awkwardness of video chats. But the newspaper also suggested some potential buyers might be turned off by Facebook’s damaged privacy reputation after a hacking attempt last month and the Cambridge Analytica scandal earlier this year. The device “has just one problem: It was made by Mark Zuckerberg,” the Post said. Zuckerberg emphasized privacy in a Monday post on his Facebook wall, saying that privacy “is built deeply” into the device. The camera has a physical cover and there is a button to turn it and the microphone off, he said. “We don’t listen to, view, or keep the contents of your calls in any way,” Zuckerberg said. Amazon, Google and Apple already have significant head starts over Facebook in the connected speaker market. Werner Goertz, an analyst at technology research firm Gartner, said he had doubts whether consumers would want to pay for Facebook devices. The social media giant is selling Portal for $199 and the larger Portal+ for $349. Goertz noted in particular that Facebook’s social focus with the speaker did not seem particularly convincing as a use case. Facebook has tried to sell hardware previously, but has never found a blockbuster product. In 2013 it partnered with electronics maker HTC for a product that was known as a Facebook phone, although their involvement was on the software side. The company has also poured money into virtual reality products since it paid $3 billion to buy Oculus and retain its employees in 2014. Apart from the Washington Post review, Facebook’s launch of Portal was met with a mix of derision and mockery from the tech press. “Just what I want today: Facebook with a deeper reach into my home,” tweeted Jason Del Rey, e-commerce reporter at Recode. John Paczkowski, tech and business editor at BuzzFeed News, tweeted that the company’s privacy claims were “belly-laugh ludicrous” in light of its security issues.